Community workers in Sanklaburi province of Thailand and the Three Pagodas Pass region of Burma claim Medecins Sans Frontieres patients undergoing medical treatment from the NGO will face difficulties now that the organization has withdrawn its services from Thailand. The Kwai River Christian Hospital’s health care coordinator, Saw Harray Moo, who has been visiting the homes of tuberculosis patients in the area told Karen News that the MSF’s medical service withdrawal is a disaster for people with serious illness. U Naing Han Tha, the secretary general of the New Mon State Party who has coordinated health care services with MSF in Sanklaburi and the Three Pagodas Pass area for more than two years is worried how MSF’s former patients will cope. U Naing Han Tha said that the majority of migrants and many people from Burma relied on the health care services provided by MSF. He said the Three Pagodas Pass hospital does not have enough medicine or it is expensive and people can’t afford the treatments. U Naing Han Tha said people are feeling desperate and helpless. MSF has been providing health care services along Thai-Burma border, particularly on tuberculosis, malaria, HIV/AIDS and reproductive health. 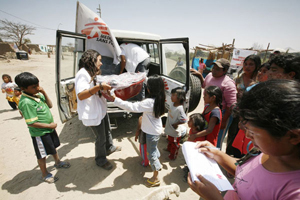 Local sources say MSF are facing major budget cuts and they cannot continue services. An HIV/AIDS patient who had always been receiving ARV pills from MSF said that he felt depressed thinking about his situation now he cannot rely on MSF for help. According to MSF’s 2010 annual report they provided treatment to a total of 3,000 patients on the Thai-Burma border. Tuberculosis patients are currently getting treatment from KRCH. According to KRCH’s health coordinator, Saw Harry Moo, it is all his organisation can handle. The Belgium-based MSF had been in Sanklaburi and Three Pagodas Pass area of Burma since 1976 and in 1999 were awarded the Noble Peace Prize. The organization was founded in 1971 and has bases in Belgium, France and Holland.